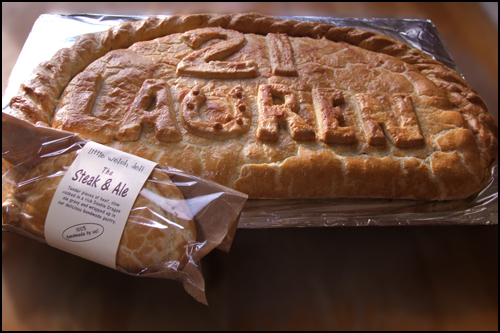 All our pasties are made by us in our bakery - including all pastry and fillings. Each pasty is individually hand crimped by us. Tender pieces of beef, slow cooked in a rich ale gravy, and wrapped up in our delicious handmade pastry. Chicken breast & smoked bacon in a delicious creamy white sauce, wrapped up in our handmade pastry. Our own recipe spicy chilli beef with beans, tomatoes, chilli and cumin wrapped in our delicious handmade pastry. Chicken breast pieces and sliced mushrooms in a creamy white sauce, wrapped up in our handmade pastry. Cawl - IN A PASTY? Ridiculous... but it works! Minced lamb, carrots, swede, parsnips, new potatoes, leeks & onions in rich gravy. Mature cheddar, spring onions, potato & creme fraiche with wholgrain & dijon mustard (suitable for vegetarians). Corned beef, fried with onions with potato and seasoned with herbs & black pepper.